In this shortened clip Archangel Metatron is channeled through Lyza and speaks about the importance of laying a clear foundation when attempting to manifest anything of value. You may want to close your eyes and feel the strong vibration that comes through the video. This video is a clip from a meditation on the 13 November 2013 where the theme was In the Company of Angels. On this night Lyza individually channeled Archangels Metatron, Michael, Gabriel, Raphael and Uriel. 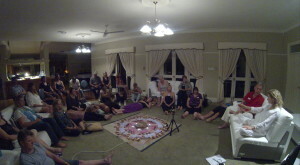 It was interesting to note that most people in the room included beginners could feel the shift in vibrations as each angelic presence came though and left. CAMERONS COMMENTS ABOUT THIS CHANNELING: This is not the first time that we have been visited from Archangel Metatron. Although he appears harsh in nature, he has often expresses his love for our work and desire for Lyza and I to progress in the channelling and the sharing of the channelling session to the spiritual community. I call it tough love, his wisdom cuts through the ego especially mine, as I am told exactly how it is. Metatron has asked us to read the keys of Enoch which is providing us with a great understanding of his role in the divine plan. LYZA’S COMMENTS ABOUT THIS CHANNELING: Metatron comes through as a golden energy for me, very similar to the vibration and colour of the Christ consciousness. He comes across as bossy, however he is ensuring that when his vibration is called it can only be used in accordance with divine alignment and divine manifestation and that the energy cannot be used to manifest anything through ego, only though divine high intention from your soul. It is amazing for me to experience the laser sharp clarity of his ability to penetrate though the ego/personality and cuts straight to the truth and the heart of the matter behind the BS. A very pure energy that does not suffer fools.